All upper extremity blocks involve the brachial plexus. 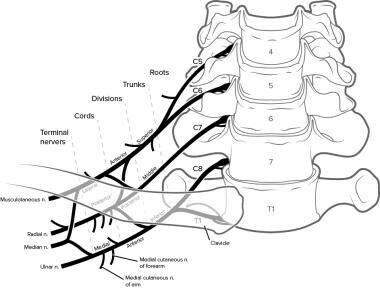 The brachial plexus arise from the anterior rami of C5-8 and T1 with some contribution from C4 and T2. The rami unite to form superior, middle, and inferior trunks. They occupy the space between the anterior and middle scalene muscles. Each trunk divides into anterior and posterior divisions, which rejoin to form 3 cords: the lateral, posterior, and medial. The medial brachial cutaneous and medial antebrachial cutaneous nerves come off the medial cord. 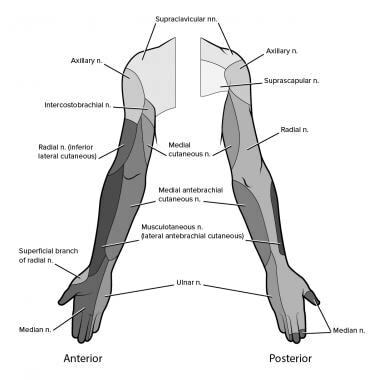 The cords then pass into the axilla and divide into nerve branches: the musculocutaneous, axillary, radial, median, and ulnar (see the image below). [3, 4] The brachial plexus can be blocked anywhere along its course, from the neck to the axilla. Formation of brachial plexus rami, trunks, divisions, cords, roots and nerves. This block provides anesthesia and analgesia for the upper extremity. It works best for analgesia below the elbow. It can provide good analgesia for tourniquet pain but is not suited for the shoulder area. It will not anesthetize the axilla or the proximal medial arm, missing the intercostal and medium cutaneous brachii nerves. It blocks the brachial plexus below the level of the clavicle close to the coracoid process. This is a good place to place a continuous catheter because it is an area with little movement and therefore less chance of being displaced. The infraclavicular block can be considered the same block as the axillary block and has the advantage of not having to move the arm over the patient’s head. Two main approaches exist. The proximal one is under the clavicle at the midpoint. The distal one is at the level of the coracoid process. Under the clavicle, the plexus are set up as divisions, as described above. They are lateral to the axillary artery proximally and rotate to surround the artery as it approaches the coracoid process. The boundaries of the infraclavicular fossa are the pectoralis minor and major anteriorly, ribs medially, clavicle and coracoid process superiorly, and humerus laterally. With the arm in adduction, it is represented on the skin with the clavicle as the superior base, the skin of the thoracic cage medial, and the medial side of the upper as the lateral wall (see the image below). This block can be deep depending on patient’s subcutaneous tissue. Innervation of the arms and hands. Sandhu NS, Capan LM. Ultrasound-guided infraclavicular brachial plexus block. Br J Anaesth. 2002 Aug. 89(2):254-9. [Medline]. Nadig M, Ekatodramis G, Borgeat A. Ultrasound-guided infraclavicular brachial plexus block. Br J Anaesth. 2003 Jan. 90(1):107-8; author reply 108. [Medline]. Macfarlane A, Anderson K. Infraclavicular Brachial Plexus Blocks. CEACCP(Continuing Education in Anaesthesia, Critical & Pain). October 2009. 9:139-143. Abhinaya RJ., Venkatraman R., Matheswaran P., Sivarajan G. A Randomized Comparative Evaluation of Supraclavicular and Infraclavicular Approaches to Brachial Plexus Block for Upper Limb Surgeries using both Ultrasound and Nerve Stimulator. Indian Journal of Anaethesia. July 2017. 7:402-416. [Medline]. Dhir S, Armstrong K, Armstrong P, Bouzari A, Mall J, Yu J, et al. A randomised comparison between ultrasound and nerve stimulation for infraclavicular catheter placement. Anaesthesia. 2016 Feb. 71 (2):198-204. [Medline]. Ultrasound image of the needle in plane with local anesthetic posterior to the axillary artery. Arrows = block needle, AA = axillary artery, LA = local anesthetic posterior to the artery. Ultrasound orientation of the muscles, arteries, and nerves in a transverse view. Short axis (transverse view)-AA=axillary artery, Arrowheads=cords, AV=axillary vein, PMM=pectoralis major, PMIM=pectoralis minor 9-12 o‘clock is cephalad to artery=lateral cord, 6-9 o'clock is posterior=posterior cord, 3-6 o'clock is caudad is medial cord. Medial cord is often hard to visualize.